If you've seen "Repo! The Genetic Opera", you know how quirky and odd that movie was. Well the same minds that brought you that have conjured another "different" piece of work that holds traces of that quirkiness, "The Devil's Carnival". 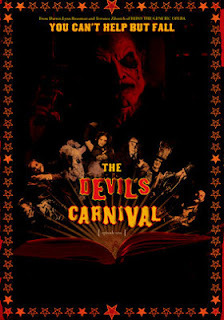 A musical about a carnival that is Hell, and Lucifer is the ringmaster. Three lost souls get cast down into this dark and empty place, not knowing how they got there. Trying to figure out where they are, each of them cross paths with each other and stumble upon darker imagery, emotional torture and fear. There were a few rough patches in the film where a song or two was lacking clarity and you couldn't make out the words, but ultimately it worked for that particular scene and/or character. The cast has some cool stars, including fellow Iowan M. Shaun "Clown" Crahan (Slipknot), Sean Patrick Flanery (Boondock Saints) and Ivan Moody (Five Finger Death Punch). For a full cast list, click here. For the simple fact that this movie had virtually no publicity, was shot in seven day and was put together in a little less, this movie is well done. With twelve songs and tormented souls and an interesting and different portrayal of Heaven and Hell (Hell is a carnival and Heaven is an old fashioned toy store), this movie is a future cult classic. Not an essential "must-have", but it does have that old fashioned cult classic feel to it. Visit The Devil's Carnival to grab of the the 6,660 numbered copies of the Ringmaster Edition. You can purchase that here. Overall, if you enjoy odd musicals and concept fims such as this with that cult overtone, you may as well get a copy. I did.